SUBHEAD: A desperate attempt at survival is repackaged as Green Smoke for delusional Techno-Optimists. 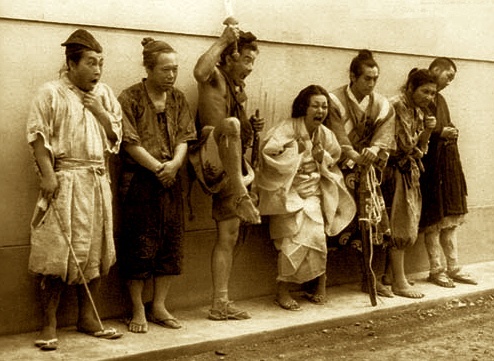 Image above: Characters who tell differing tales of the same murder on set of the classic 1950 Japanese film "Roshomon directed by Akira Kurosawa. From (http://www.toshiromifune.org/images/). A tale told many times - everytime getting more whitewash. Many online sites have picked up on this sorry public relations press release. It seems Japan is willing to gamble on grow crops in radioactive soil for its fastfood retail market in order to save Fukushima farmers from oblivion. The self deception is palpable here. The characterization of this feeble attempt to restore agriculture on radioactive waste while providing barely enough solar power to light the doomed farmers temporary housing is beyond Green Smoke and into the realm of delusional thinking. "What does radioactive salad taste like? How about rice sprinkled with nuclear fallout? Well, if you're truly curious, consider taking your next vacation in Fukushima, where some intrepid farmers have begun the daunting task of farming the region's tainted soil." While the proceeds from the crops and energy will be ploughed back into the project, the Renewable Energy Village's creators hope the model will be mimicked by farmers whose livelihoods were decimated by the nuclear disaster. "People evacuated from areas closer to the plant have given up ever farming their fields again," says project leader Ryozo Hakozaki. "There might be an amusement park feel to the project, but we're trying to show them what the future could hold." This is like the classic Japanese story from the 1950 movie "Roshomon". The film is known for a plot device which involves various characters providing alternative, self-serving and contradictory versions of the same murder incident at the Roshomon Gate of the city of Kyoto. SUBHEAD: A high tech farm aims to relclaim Fukushima contaminated soil for food crops. Image above: Colorful sunset and green grass frame these soalr panels in a stock photo from article. Construction has just begun on a futuristic farming project in Japan’s Fukushima prefecture. 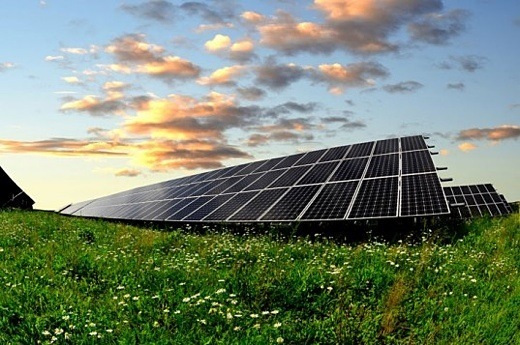 A combination farm and solar park, the Renewable Energy Village will contain 120 photovoltaic panels that will generate about 30 kilowatts of power to be sold to a local utility company. Crops will be grown beneath those panels in what’s being called a “solar sharing” layout. Of course, the biggest question on most people’s minds isn’t how much energy the project will generate, but whether it’s safe to grow crops in radiation-contaminated soil. Unfortunately, there aren’t any easy answers to this question. Ultimately, it depends on a number of factors, from the way the soil is treated to which plants are grown. Adding potassium to the fields prior to planting will reduce the amount of cesium and other radioactive materials in the soil. Planting crops which are resistant to radiation and tend not to absorb it will also yield safer harvests. For example, rice grown in the area in early 2013 was tested repeatedly for radiation, and was found to be safe enough to sell on the open market, and one Japanese fast food chain is starting to experiment with growing cabbage and onions in the region. While it’s temping to write off the entire effort as misguided or dangerous, the truth is, the people of Fukushima need the work. The region’s economy has traditionally revolved around agricultural labor, and the 2011 tsunami and nuclear disaster have been devastating to the local population. Even if it turns out the new farming methods aren’t safe or successful, being able to capitalize on Japan’s fast-growing solar market should give those who’ve been hit hardest by the disaster a much-needed financial boost. Japan’s Agency for Natural Resources and Energy has announced plans to build the world’s largest offshore wind farm near Fukushima as part of plans to reconstruct the area stricken by nuclear disaster in 2011. Former Tepco executive Eiju Hangai, who quit the company a few months before the 2011 devastating tsunami and nuclear meltdown in Fukushima, has built a solar agricultural park near the power plant. SUBHEAD: Brave People Are Building Futuristic Farms on Japan's Radioactive Soil. 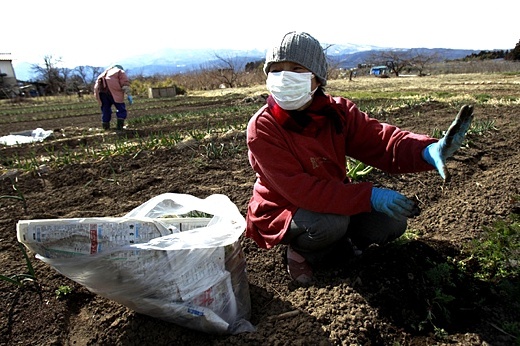 Image above: Fukushima farmer planting crops in radioactive soil wearing mask and rubber gloves from original article. What does radioactive salad taste like? How about rice sprinkled with nuclear fallout? Well, if you're truly curious, consider taking your next vacation in Fukushima, where some intrepid farmers have begun the daunting task of farming the region's tainted soil. Construction just began on a rather futuristic project in the Fukushima prefecture. The so-called Renewable Energy Village is both a farm and a solar park with 120 photovoltaic panels that generate 30 kilowatts of power, which are sold to a local utility company. The "solar sharing" layout means that the crops grow beneath the solar panels. There are plans to add windmills and possibly an astronomical observatory on the land as well. But the big question remains: Is it really safe to grow crops in Fukushima's radioactive soil? The answer is complicated. Generally speaking, it's not a good idea to grow food in soil that's been contaminated by nuclear fallout. However, if the radiation levels in the soil are low enough, and if farmers pick the right crops—some absorb radiation more than others—consuming the plants can be harmless. Farming started up in Fukushima last spring for the first time after the March 2011 earthquake and tsunami. Rice was one of the first crops grown, in small quantities at first. Some farmers first treated the soil with minerals like potassium that reduce the amount of cesium and other radioactive materials. Once harvested, the rice also underwent extensive radiation checks before being sold on the open market. Nowadays, locals are warming to the idea of farming on the land again, since consumers are getting comfortable with the idea of eating their crops. Last fall, the major fast food chain Yoshinoya announced that it would start to grow rice, onions, and cabbage in the Fukushima prefecture. The company said in a statement that it believes "this will lead to support for reconstruction." And the region needs it: Agriculture has traditionally been the lifeblood of the local economy, and the region was hit hard as farming was brought to an abrupt halt after the disaster. The creative approach taken by the Renewable Energy Village seems like a good next step. Even though the crops they're growing (rapeseed in this case) are safe, just think of it this way. If farming doesn't work out, they can just focus on the solar energy business—one of Japan's burgeoning markets. SUBHEAD: Renewable Energy Village offers lifeline to decimated Fukushima farmers. It seems the most unlikely place to try to put a utopian blueprint into practice. Yet a patch of land in Fukushima, the Japanese prefecture contaminated by nuclear fallout in 2011, holds the foundations of a model village of the future. The prefecture was affected by the meltdowns at the Fukushima Daiichi nuclear plant, following the earthquake and subsequent tsunami in March 2011. Now construction has started on a community-run project in the coastal city of Minamisoma to reuse farmland contaminated by fallout. About two-thirds of the city's farmland lies within the nuclear evacuation zone. So far the Renewable Energy Village (REV) boasts 120 photovoltaic panels, generating 30 kilowatts of power which is sold to a local utility. Plans are afoot to put wind turbines on some of the land. Recreational and educational facilities as well as an astronomical observatory will also be built if further funding can be secured. Central to the project is what the Japanese call "solar sharing" – growing crops beneath raised solar panels. One crop that has already been planted, namely rapeseed, was chosen, say project organisers, because its oil is free of contaminants even though the plants themselves take in some radioisotopes such as those of caesium. Generous feed-in tariffs set by the government support the project. While the proceeds from the crops and energy will be ploughed back into the project, the REV's creators hope the model will be mimicked by farmers whose livelihoods were decimated by the nuclear disaster. "People evacuated from areas closer to the plant have given up ever farming their fields again," says project leader Ryozo Hakozaki. "There might be an amusement park feel to the project, but we're trying to show them what the future could hold." Since the feed-in tariff was introduced in mid-2012, several other large-scale solar parks around Japan have been announced or are already in operation – but none uses solar sharing. Most have solar panels resting on the ground itself, which makes growing crops impossible. One will be the country's largest solar park, also in Minamisoma. Hakozaki says such large-scale ventures could threaten Minamisoma's farming traditions. "If farmers decide to sell up their land, entire communities will be wiped off the map." The Renewable Energy Village model offers a way around this issue, says project chairman Sohei Takahashi, who plans to conduct research into crops that can tolerate radioactive contamination. "Through the project we can protect farmland and communities, and with two parallel revenues create increased prosperity compared with before the disasters," he says. No Well! - No Way! Cheerios to go GMO free!